This app helps in reminding birthdays and notifying you friend’s birthdays. 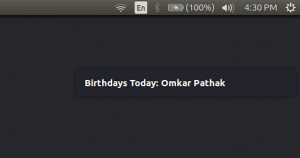 This app uses Python and Ubuntu notifications to notify users on every startup of the system. # manually edited or can be automated. # For simplicity, we will edit it manually.
. This will add our executable script to /usr/bin. NOTE: The script runs automatically(once added to startup) everytime you start your system. Also, If you have more than two birthdays on the same day, both the birthdays will be notified in the notification. first_page How Google Updates Itself!